As your child heads towards the grade school years, building fine motor skills becomes increasingly important. Even though your child may still be in preschool now, she’s developing abilities that will help her in the long-term. That includes kindergarten, elementary school and the rest of her life. Fine motor, or hand and finger, skills definitely fall under that “must develop now” category. When it comes to fine motor skills, your child is building eye-hand coordination, dexterity, grip, and the ability to control her own movements. These growing developments help her to write, feed herself, dress herself, and do anything that involves her hands. Don’t worry if your pre-k kiddo can’t write the entire alphabet write now. She’s probably still working on her first few letters. That’s why developing fine motor abilities is so important during the preschool years. Think of what your child does now as the building blocks of other, more complex, motor movements. How can your child work on fine motor skills? 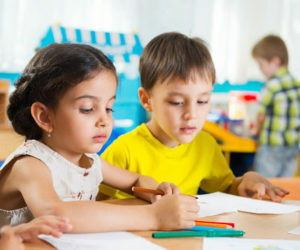 While sitting and writing letter after letter will technically work, this type of rote activity isn’t likely to hold your preschooler’s attention. Instead, try an artsy activity that engages and educates your child. Collage art provides plenty of opportunities for developing fine motor skills. There are a few different ways to go here. Torn paper collages are easy for little hands but can still help to build muscle strength and eye-hand coordination. Give your preschooler tissue paper or thin construction paper. Let her tear away, creating an array of differently sized pieces in a rainbow of colors. Now it’s time to glue the papers to a piece of cardboard or thick card stock paper. She can use the torn papers to make an abstract piece of art or she can make “something” (such as a picture of a house, an animal, a train, or anything else your child can dream up). As your child builds her fine motor skills, start upping the complexity and give her scissors — kids’ safety scissors, that is. Instead of tearing the paper, she can cut it into small pieces and different shapes. Follow the same directions, gluing the papers onto a piece of board. Yes, you read that correctly. It says finger paint, but with clay. How is this possible? This art activity is a low-mess version of the real deal. This means that your creative kid can try this one almost anywhere. Instead of paints, swap in soft modeling clay. Your child will start the fine motor workout by tearing the clay into dime-sized pieces. Next, she can “finger paint” the clay onto cardboard. She’ll use the same motion as if she were finger painting, but instead of temperas, she’ll smooth the clay onto the surface. The clay will stick to the board, creating a textured, paint-like piece of art. Painting with clay takes slightly more finger strength than using real paints. This adds to the fine motor development objectives of this activity. You’re fairly certain that your preschooler can’t handle a real needle. Not yet at least. This doesn’t mean that she can’t sew, though. Use a hole punch to make a pattern around the outside edge of craft felt pieces or craft foam sheets. Pull a piece of yarn through the first hole and tie it at the edge. Now your child can “sew” the yarn through the holes, winding it around the felt or foam until it gets to the end. You can add to this project by folding the felt over, cutting it into shapes, or creating mini purses and animals to stuff. Learn more about how your child can benefit from fine motor, and other learning, activities. Call Kid’s Country Learning Center for more information on what a quality preschool program can do for your child.